You can cook the plums in advance: wash, quarter and stone them. Put in a pan with the cinnamon, peppercorns, sugar and 1 tbsp water, over a medium-low heat. Once the sugar begins to dissolve and the plums to exude their juice, increase the heat slightly and simmer gently for 10 minutes or until the plums are tender. Remove and, if making in advance, chill until cold. 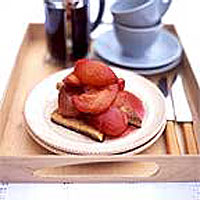 Reheat the plums before making the toast. Make the toast one or two slices at a time. For each person, beat one egg with 1 tsp sherry and a pinch of salt. Pour into a shallow bowl. Cut a slice of bread in half diagonally. Soak in the egg for 5 minutes, turning once. To cook each portion of toast, melt 15g butter in a frying pan over a low heat. As soon as it begins to froth, add the eggy bread and fry for a minute or two on each side. Arrange on a plate, sprinkle with cinnamon sugar and ladle on some of the warm plums and their juice. Serve immediately, with or without crème fraîche.